Donald Trump's use of social media attracts worldwide attention. He frequently uses Twitter and other social media platforms to make comments about other politicians, celebrities and daily news. From his official declaration of candidacy in June 2015 through the first two years of his presidency, he tweeted over 14,000 times. Since early in his presidency, his tweets have been "considered official statements by the President of the United States," according to then-White House Press Secretary Sean Spicer. He often posts controversial or false statements, and his advisors have warned him that his tweets may alienate some of his supporters. In a June 2017 Fox News poll, 70 percent of respondents said Trump's tweets were hurting his agenda. In a January 2019 UMass Lowell poll, 68 percent of all respondents aged 18-37 said Trump tweets too much. The emergence of social media has changed the way in which political communication takes place in the United States. Political institutions such as politicians, political parties, foundations, institutions, and political think tanks are all using social media platforms, like Facebook and Twitter, to communicate with and engage voters. Regular individuals, politicians, "pundits" and thought leaders alike are able to voice their opinions, engage with a wide network, and connect with other likeminded individuals. According to Wael Ghonim, social media can reinforce pre-existing beliefs rather than promote new ones. Social media, while a great source of gathering volunteers and money, serves the main purpose of affirming political beliefs and strengthening a political base. Politicians have a platform to communicate with that is different from the mainstream media. Politicians have the ability to raise large amounts of money in relatively short periods of time through social media campaigns. In 2012 President Barack Obama raised over a billion dollars for his campaign, which broke the fundraising record. Around $690 million was raised through online donations including social media, email, and website donations and more money was raised from small donors than ever before. The 2008 US presidential election was the first election in which candidates utilized the Internet and social media networking as a communicative tool incorporated into candidates' campaigns. In 2008, President-elect Barack Obama was the first to use the Internet to organize supporters, advertise, and communicate with individuals in a way that had been impossible in previous elections. Obama utilized sites like YouTube to advertise through videos. The videos posted on YouTube by Obama's were viewed for 14.5 million hours. As of 2012[update], election more candidates were utilizing a wider array of social media platforms. Politicians were now on social networking sites like Twitter, Instagram, YouTube and other new social media tools and mobile apps. Some of the candidates used social media sites to announce their candidacy. Barack Obama emailed a video to 13 million when he announced his intention to run for re-election and Mitt Romney sent out a tweet. By May 16, 2011, @BarackObama was followed by 7.4 million people, including twenty-eight world leaders. His account became the third account to reach 10 million followers in September 2011. Donald Trump's tweet activity from his first tweet in May 2009. His tweet activity pattern has changed from 2013. From his official declaration of candidacy on June 16, 2015 to the election on November 8, 2016, he tweeted 7,794 times, benefiting from large numbers of supporters active on social media. (Some supporters called themselves “Centipedes” online.) In the two months between the election and his inauguration, he tweeted 364 times. During the first two years of his presidency (January 20, 2017 - January 19, 2019), he tweeted 6,243 times. In 2009, marketing staffer Peter Costanzo suggested to Trump that he could use social media to draw attention to his book, Think Like a Champion, which was due to be released later that year. He was unable to use the username @DonaldTrump, as it was already being used by a parody account. He and his marketing team decided to use the username @realDonaldTrump. Trump joined Twitter in March 2009 and sent out his first tweet on May 4, 2009, advertising his upcoming appearance on the Late Show with David Letterman, which was due to air a couple of days later. From 2009 to 2011, tweets posted by the @realDonaldTrump account included the phrase "from Donald Trump" to distinguish them from those written by his staff, but by about June 2011, as Trump's use of the platform increased, those identifying labels disappeared. By the 2016 campaign, researchers observed that some tweets—often those with the most critical opinions—were being submitted from an Android phone, while others were sent to Twitter from an iPhone. This suggested that members of Trump's staff were still responsible for some of the messages sent under his account, a suspicion that was largely confirmed using sentiment analysis. As president, Trump stopped use of his Android due to security concerns; however, machine learning and natural language processing could still frequently distinguish Trump's tweets from those sent in his name, even when staffers attempted to emulate his writing style. In 2012, following the victory of President Barack Obama in the US Presidential election, Trump tweeted a chain of disparaging comments about Obama's win. Trump began that Election Day with a flurry of familiar complaints. He mocked Obama for playing basketball and blamed the Chinese for creating "the concept of global warming". Trump tweeted the next day, "but we'll have to live with it!" and: We have to make America great again! In response, Obama quipped on The Tonight Show With Jay Leno that Trump's beef with him "dated back to their days growing up in Kenya". From 2013 onwards, Trump's Twitter activity pattern significantly increased in the volume of his tweets and the rate of politically charged rhetoric, channeling the same bluntness that helped fuel his political rise. In 2017, Trump was described as "possibly the first 'social media' and 'reality TV' president" in an article by Van Jones on CNN's website in October 2017. Following Trump's inauguration, he gained control of the official U.S. Presidential Twitter account (@POTUS), which had been created by the previous President, Barack Obama. Trump's first tweets as president were made from his personal account, but he has used both accounts. Trump is a known viewer of the Fox News show Fox & Friends and has tweeted reactions to what he has seen on the show on numerous occasions. One well-known example is his tweet on January 2, 2018, when he stated that his "Nuclear Button" was "much bigger & more powerful" than Kim Jong Un's, following a Fox News segment about Jong Un's "Nuclear Button" minutes before. Trump watches several hours of cable news shows each day, using the "Super TiVo" he had installed at the White House. News organizations have compiled lists of Trump tweets directly repeating what he was watching. The result is that stories that Fox concentrates on become nationally important stories by virtue of the fact that they appear in presidential tweets, setting up a feedback loop. For his first year in office, he has mentioned the Fox & Friends Twitter account more than any other account. In January 2016, a review by The New York Times found that one in every eight posts by Trump on Twitter "was a personal insult of some kind". As of January 2019[update], Trump had insulted 551 people (including private citizens), places, and things on Twitter, ranging from politicians to journalists and news outlets to entire countries. A 2015 Trump tweet against an 18-year-old college student who had challenged him at a New Hampshire political forum led to a wave of online harassment against her. In December 2016, then-president-elect Trump responded to criticism from the president of United Steelworkers Local 1999 in Indiana by tweeting that the local union leader "has done a terrible job representing workers"; the union president received threatening phone calls afterward. Trump often gives opponents nicknames such as "Crooked Hillary" and "Lyin' Ted". Trump has been criticized for his practice of retweeting or copying material from social media accounts posting antisemitic, racist, or false information, such as claims exaggerating the number of crimes committed by black people. PolitiFact singled out as particularly obviously false an image retweeted by Trump that claimed that 81% of white murder victims are killed by black people. Politifact noted that, besides being a five-fold exaggeration, the claim was sourced to the non-existent "Crime Statistics Bureau, San Francisco"; it later highlighted this retweet when awarding its 2015 "Lie of the Year" badge to Trump's entire presidential campaign. The fake statistics were first posted by a neo-Nazi Twitter account. An image posted by Trump on July 2, 2016 called Hillary Clinton the "Most Corrupt Candidate Ever!" and featured a six-pointed star reminiscent of the Jewish Star of David; the image first appeared in a June 15 tweet by "@FishBoneHead1," a Twitter account described by the Associated Press as being known for "anti-Clinton and right-leaning messages and images" and by Mic as promoting "violent, racist memes," before making its way to 8chan's /pol/ on June 22. Trump's social media manager Dan Scavino responded that the image had been sourced by him from a Twitter page "where countless images appear" and that he had assumed that the star referred to a sheriff's badge. Under two hours later, the tweet was deleted from Trump's account in favor of a nearly identical tweet with a circle in place of the star, but Trump later blamed the deletion on his staff, stating: "I would've rather defended it." Jeremy Diamond of CNN observed: "It wasn't the six-pointed star alone that evoked anti-Semitism—it's the combination of the star with a background of money and an accusation of corruption, which suggests stereotypical views of Jews and money and raises conspiracy theories that Jews control political systems." The episode led Dana Schwartz, a Jewish employee of Trump's son-in-law Jared Kushner, to write an open letter to him in protest, to which he responded. President Donald Trump with Prime Minister Theresa May in the Oval Office at the White House in Washington, D.C., January 27, 2017. The May Ministry condemned Trump's Tweets and Britain First. On November 29, 2017, Trump retweeted three inflammatory and unverified anti-Muslim videos from Britain First, the British far-right and ultranationalist group that has a history of posting misleading videos. One of the videos purported to show an assault by a Muslim immigrant, but the assailant was neither a Muslim nor an immigrant. Another video was filmed in 2013 during the Syrian Civil War, showing a man, who is believed to be an Al-Nusra supporter, destroying a statue of Mary and stating: "No-one but Allah will be worshipped in the land of the Levant." A third video contains footage filmed during a period of violent unrest following the 2013 Egyptian coup d'état. The videos had been shared by Jayda Fransen, the deputy leader of Britain First, who was convicted of religiously aggravated harassment in Britain in 2016. Trump's promoting inflammatory content from an extremist group was without precedent among modern American presidents. Trump's actions were widely condemned both in the U.S. and abroad by politicians, commentators and religious leaders of various faiths and across the political spectrum; also by several civil rights and advocacy groups and organizations. The incident resulted in calls for Trump to be banned from the UK, but his invitation to visit to the United Kingdom was not withdrawn. When asked by PBS NewsHour, 29 Democratic and four Republican senators criticized the tweets. Prime Minister of the United Kingdom Theresa May said in a statement, "it is wrong for the president to have done this" and "Britain First seeks to divide communities through their use of hateful narratives which peddle lies and stoke tensions." Trump's sharing of the tweets was praised across far-right circles, increased Islamophobic comment on social media, and elevated the profile of Britain First. In Britain, It was hailed by Fransen herself and by Britain First's leader Paul Golding, who said “Donald Trump himself has retweeted these videos and has around 44 million followers! God Bless You Trump!" White House Press Secretary Sarah Huckabee Sanders defended Trump's tweets, saying "Whether it's a real video, the threat is real and that is what the president is talking about." On November 30, 2017, Sanders said that Trump's actions "elevate the conversation to talk about a real issue and a real threat, that’s extreme violence and extreme terrorism." Trump responded to criticism from May by publicly rebuking her on Twitter, sparking a rare rift between the United Kingdom and the United States. On December 18, almost three weeks after being retweeted by Trump, the accounts of Britain First, Paul Golding and Jayda Fransen were all suspended by Twitter. In a January 2018 interview with Piers Morgan for Good Morning Britain, Trump said he was not familiar with Britain First when he retweeted them, stating, "If you are telling me they’re horrible people, horrible, racist people, I would certainly apologise if you’d like me to do that." In August 2018, Trump tweeted that he had asked Secretary of State Mike Pompeo to "closely study the South Africa land and farm seizures and expropriations and the large scale killing of farmers". The tweet was sent shortly after a segment by Fox News where Tucker Carlson claimed that the "racist government of South Africa" was targeting white-owned farms for land reform due to anti-white racism. In response, South Africa's Minister for International Relations and Cooperation Lindiwe Sisulu claimed that Trump was expressing "right-wing ideology" and also added that the South African government had requested an explanation for the tweet from the US Chargé D'affaires. The US Embassy in South Africa rebuked Trump's tweet, claiming that there is "no evidence that murders on farms specifically target white people or are politically motivated”. There are no reliable figures that suggest that white farmers are at greater risk of being killed than the average South African, and the fact-checking organization Afri-Check claims that "whites are less likely to be murdered than any other race group" in South Africa. The talking point is often used by far right groups as evidence for a white genocide in South Africa. This has been condemned as false by Genocide Watch. In a succession of tweets on March 4, 2017,[a] President Trump stated he had "just found out" that former President Obama had wiretapped the phones in his offices at Trump Tower during the last months of the 2016 election. The tweets resulted in a week of media attention given to the allegations, despite scarce evidence. Fake news websites did also take up the allegations, and one even claimed that a warrant for Barack Obama's arrest had been given. He did not say where he had obtained the information and offered no evidence to support it. Trump compared the alleged intrusion to McCarthyism and Watergate. Anonymous White House officials told The Washington Post that Trump did not appear to coordinate his comments with other White House officials. In September, CNN reported that the FBI wiretapped Paul Manafort, Trump's former campaign chairman, in 2016-17, either during or after his tenure with the Trump campaign. This does not confirm the accuracy of Trump's tweets, as it is not known whether any surveillance of Manafort took place at Trump Tower and there is no evidence that Obama requested the wiretap, which was authorized by a Foreign Intelligence Surveillance Act (FISA) court warrant. Trump has repeatedly attacked former FBI Director James Comey, whom Trump dismissed from office, via Twitter. Trump has posted a number of angry tweets directed at Robert Mueller, who was appointed as a special prosecutor to investigate Russian interference in the 2016 presidential election. On May 31, 2017, Trump sent out a tweet that read, in its entirety, "Despite the constant negative press covfefe". It immediately went viral, becoming an Internet meme and a source of widespread jokes. The tweet was retweeted over 127,000 times, and liked more than 162,000 times, making it one of Trump's most popular tweets in months, as people speculated on the meaning of covfefe. Six hours later, Trump deleted the tweet and posted an alternative one, asking people what they thought covfefe could mean. The Independent later noted that covfefe most likely meant coverage. Off camera, at a press briefing later the same day, Sean Spicer responded to questions about the tweet with the statement "the president and a small group of people know exactly what he meant". No further explanation was given during the briefing. Some reporters, observing that Spicer did not appear to be joking, were concerned by the implications. Conservative columnist Jonah Goldberg, writing for the National Review, considered it unlikely that covfefe is "some esoteric code word", suggesting instead, "Spicer feels compelled to protect the myth of Trumpian infallibility at all costs". The Atlantic's Megan Garber felt that Spicer's response further divided the White House from the public by giving a likely typo "the whiff of conspiracy". At The Washington Post, Callum Borchers instead argued that the deliberately obscure response was an intentional tactic to distract the media and public from the administration's other controversies. Leonid Bershidsky, writing for Bloomberg View, compared the phenomenon to an incident in which President Ronald Reagan made a gaffe while joking on a live microphone, "We begin bombing in five minutes." Bill Coffin of Compliance Week noted: "In Reagan's case, he immediately admitted the error and squashed it. In Trump's case, he sent a wrong message and then allowed it to sit for hours untended." 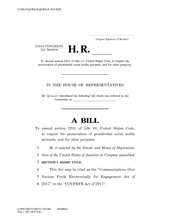 Two weeks later, Democratic representative Mike Quigley filed legislation titled the Communications Over Various Feeds Electronically for Engagement (COVFEFE) Act. The bill would amend the Presidential Records Act to cover social media, thus requiring tweets and other social media posts by the U.S. President to be preserved under law. About a year later, on May 17, 2018, Trump jokingly said “I hear covfefe” in response to the Yanny or Laurel meme. The state of Georgia prohibited the use of the word covfefe on vanity license plates. After the June 2017 London attack, Mayor of London Sadiq Khan condemned it and said that "the city remains one of the safest in the world" and there was "no reason to be alarmed" over the increased police presence around the city. The latter comment was taken out of context and criticized by Trump in a tweet: "At least 7 dead and 48 wounded in terror attack and Mayor of London says there is 'no reason to be alarmed!'" Trump's comments were described as a deliberate misrepresentation of Khan's remarks by Khan's spokesman, as well as by former U.S. Vice President Al Gore. Prime Minister Theresa May said that "Sadiq Khan is doing a good job and it is wrong to say anything else". Conservative minister Penny Mordaunt and Liberal Democrat leader Tim Farron also backed Khan. Farron said, "Sadiq Khan has shown calm and dignified resolve in the face of these cowardly terrorist attacks. He is more of a statesman than Donald Trump will ever be." Lewis Lukens, the former US ambassador to the UK, and the United States Conference of Mayors declared their support, with Lukens commending Khan's "strong leadership" in leading London forward after the attack and also praising the "extraordinary response" from the law enforcement community. Trump tweeted the following day that the London Mayor was offering a "pathetic excuse" for his statement, and alleging that the mainstream media were "working hard to sell" Khan's explanation. When asked about these comments following a vigil held near Tower Bridge, Khan stated that he was busy dealing with the aftermath of the attack and declared that he has not "got the time to respond to tweets from Donald Trump". Trump's sons, Donald Trump Jr. and Eric Trump, defended his comments and claimed that Khan, who worked along with the security services and held a vigil for victims of the attack, was not doing enough to combat terrorism. Trump Jr. stated that Khan should stop attacking his father, despite the fact that Khan did not respond to Trump's comments. Senator John McCain criticized the comments made by Trump, stating that America was "not showing leadership around the world." During the same discussion, McCain also commented that the former-President Barack Obama and his administration had offered better leadership. He later partially retracted by stating that only certain "different aspects" were better during Obama's presidency, but still stood by his criticism of Trump's social media views. The Qatar diplomatic crisis is an escalation of the Qatar–Saudi Arabia proxy conflict, it began when several countries abruptly cut off diplomatic relations with Qatar in June 2017. These countries included Saudi Arabia, United Arab Emirates, Bahrain, and Egypt, which cited Qatar's alleged support for terrorism as the main reason for their actions. The severing of relations included withdrawing ambassadors, and imposing trade and travel bans. President Donald Trump claimed credit for engineering the diplomatic crisis in a series of tweets. On June 6, Trump began by tweeting: "During my recent trip to the Middle East I stated that there can no longer be funding of Radical Ideology. Leaders pointed to Qatar – look!" An hour and a half later, he remarked on Twitter that it was "good to see the Saudi Arabia visit with the King and 50 countries already paying off. They said they would take a hard line on funding extremism, and all reference [sic] was pointing to Qatar. Perhaps this will be the beginning of the end to the horror of terrorism!" This was in contrast to attempts by The Pentagon and State department to remain neutral. The Pentagon praised Qatar for hosting the Al Udeid Air Base and for its "enduring commitment to regional security." US Ambassador to Qatar, Dana Shell Smith, sent a similar message. Earlier, the US Secretary of State had taken a neutral stance and called for dialogue. On June 29, 2017, Trump tweeted about Morning Joe hosts Mika Brzezinski and Joe Scarborough, who earlier in the day had talked about Trump on their show. The tweets referred to the hosts as "low I.Q. Crazy Mika, along with Psycho Joe", and claimed that Brzezinski tried to join Trump on New Year's Eve but was declined because she was bleeding from a facelift. The comments were quickly met with condemnation from both the left and the right. Paul Ryan, Speaker of the House, stated, "Obviously, I don't see that as an appropriate comment." Nancy Pelosi, Minority Leader of the United States House of Representatives, stated that the tweet "really saddens me because it is so beneath the dignity of the president of the United States to engage in such behavior". Maine Republican Senator Susan Collins tweeted, "This has to stop – we all have a job – 3 branches of gov't and media. We don't have to get along, but we must show respect and civility." Rebukes also came from Oklahoma Republican Senator James Lankford, New York Democratic Representative Nita Lowey, and Kansas Republican Representative Lynn Jenkins. MSNBC stated, "It's a sad day for America when the president spends his time bullying, lying and spewing petty personal attacks instead of doing his job." Aaron Blake of the Washington Post wrote an article titled "Trump's very bad tweets about Mika Brzezinski are a microcosm of his struggling presidency." Seemingly in defense of Trump, Melania Trump's spokeswoman Stephanie Grisham released the statement: "As the First Lady has stated publicly in the past, when her husband gets attacked, he will punch back 10 times harder." Sarah Huckabee Sanders stated, "Look, I don't think that the president's ever been someone who gets attacked and doesn't push back. ... This is a president who fights fire with fire and certainly will not be allowed to be bullied by liberal media and the liberal elites in Hollywood or anywhere else." On July 1, 2017, Trump tweeted "Crazy Joe Scarborough and dumb as a rock Mika are not bad people, but their low rated show is dominated by their NBC bosses. Too bad!" After these tweets, Trump's approval rating decreased from 40% to 37%, according to a Gallup poll. However, the RealClearPolitics average of polls showed his approval rating remained virtually unchanged in the same time period. On July 2, 2017, Trump tweeted a video of himself attacking Vince McMahon during WrestleMania 23 with the CNN logo over McMahon's face. In response, Brian Stelter of CNN issued a statement saying that Trump was "encouraging violence against reporters" and "involved in juvenile behavior far below the dignity of his office". CNN also responded to the tweet by quoting Sarah Huckabee Sanders who claimed the previous week "The president in no way form or fashion has ever promoted or encouraged violence." Homeland Security Advisor Tom Bossert said that "no one would perceive [the tweet] as a threat." Trump subsequently said that CNN took the post too seriously, adding that CNN has "hurt themselves very badly". The clip appeared on pro-Trump subreddit, /r/The Donald, about four days earlier, and was created by a Reddit account which had previously posted racist, antisemitic and bigoted content. A White House official later denied that the video came from Reddit; the official declined "to respond to questions about where the president obtained the clip." As of December 20, 2017[update], the tweet had been retweeted over 330,000 times, making it Trump's most retweeted post. In September 2017, Trump posted tweets about North Korea that some saw as violating Twitter's rule against making threats of violence. On September 19, he stated that under certain circumstances, "we will have no choice but to totally destroy #NoKo", and on September 23, "Just heard Foreign Minister of North Korea speak at U.N. If he echoes thoughts of Little Rocket Man, they won't be around much longer!" ("Little Rocket Man" is Trump's nickname for North Korean leader Kim Jong-un.) In response to user concerns, Twitter cited newsworthiness and whether the tweet is of public interest as factors they consider in whether a tweet violates their rules. The company acknowledged that these guidelines are internal, and stated they would update their public-facing rules to reflect them. As president, Trump has frequently used Twitter to make personal attacks against federal judges who have ruled against him in court cases. In February 2017, Trump referred to U.S. District Judge James Robart, who had enjoined Trump's travel ban from taking effect, as a "so-called judge" and wrote, "If something happens blame him and court system. People pouring in. Bad!" Legal experts expressed concerns that such comments undermined the federal judiciary and could "undermine public confidence in an institution capable checking his power." In June 2017, Trump criticized his own United States Department of Justice for defending his "watered down, politically correct version" of a travel ban (which Trump signed in March 2017) in court, rather than an initial version of the ban that Trump has signed in January 2017 (and was later declared unconstitutional by federal courts). In January 2018, Trump tweeted that his Justice Department is part of the American "deep state". In March 2018, Trump tweeted that "there was tremendous leaking, lying and corruption at the highest levels of the FBI, Justice & State" Departments. Previously in December 2017, Trump tweeted that the FBI's "reputation" was at its the worst ever after years under James Comey. In June 2017, Trump tweeted that Deputy Attorney General Rod Rosenstein's investigation of Trump (via a special counsel Robert Mueller) was a "witch hunt". In March 2018, Trump reiterated that the "Mueller probe should never have been started" and was a "WITCH HUNT!". Trump has tweeted disapproval of Attorney General Jeff Sessions on various occasions. In October 2017, Trump tweeted that Secretary of State Rex Tillerson was "wasting his time trying to negotiate with" North Korean leader Kim Jong-un. In March 2018, Trump fired Tillerson via a tweet. In February 2018, after National Security Advisor H. R. McMaster said there was "incontrovertible" evidence that Russia had interfered in the 2016 election, Trump tweeted that McMaster "forgot to say" that the Russians had colluded with the Democrats and that the Russians had not impacted the election results. Trump has repeatedly tweeted about the arrest of illegal aliens on criminal charges as an argument for building a border wall between the United States and Mexico. Criminal prosecutions that he has discussed in this context include that of Wilbur Ernesto Martinez-Guzman,, Gustavo Arriaga Perez, and Cristhian Bahena Rivera . The @realDonaldTrump account has blocked various Twitter accounts from viewing his Twitter feed. In July 2017, a lawsuit was brought by the Knight First Amendment Institute at Columbia University in United States District Court for the Southern District of New York. (The federal suit, case number 1:17-cv-05205, was filed in the Southern District of New York.) The plaintiffs are 7 Twitter users, whose accounts had been blocked from President Donald Trump's personal Twitter account, alleging that the @realDonaldTrump account constitutes a public forum. The lawsuit argues that blocking access to @realDonaldTrump account is a violation of constitutional rights and a violation of the plaintiff's First Amendment rights. Issues arise as to how the Constitution applies to freedom of speech in digital computer technologies that facilitate the creation and sharing of information, ideas, career interests and other forms of expression via virtual communities and networks. The lawsuit also names as defendants White House press secretary Sean Spicer and social media director Dan Scavino. In May 2018, U.S. District Judge Naomi Reice Buchwald of the Southern District of New York ruled that the plaintiffs “were indisputably blocked as a result of viewpoint discrimination.” She also ruled that elements of @realDonaldTrump constitute a public forum. Viewpoint discrimination in those elements that are public forums is a violation of the First Amendment. Trump's statements in tweets have been cited in court challenges against his actions as president; his Twitter posts on Muslims have been significant in legal challenges to Executive Order 13769 (which Trump has called a "travel ban"), as courts have considered Trump's statements in assessing the motivations and purpose of the order. In 2017, Trump's tweets were cited by both the U.S. Court of Appeals for the Fourth Circuit and the U.S. Court of Appeals for the Ninth Circuit, which upheld rulings blocking Trump's executive order as unconstitutional. In its opinion, the Fourth Circuit cited the "backdrop of public statements by the President and his advisers and representatives" as evidence that the order "drips with religious intolerance, animus, and discrimination"; the Ninth Circuit wrote that "throughout these judicial proceedings, the president has continued to make generalized, often inflammatory, statements about the Muslim faith and its adherents," including through Tweets. Peter J. Spiro, a legal scholar at Temple University, noted that Trump's November 2017 tweets of anti-Muslim videos would almost certainly be cited by challengers to Trump's third version of a travel ban, as evidence that the orders were unconstitutionally motivated by anti-Muslim animus. "[Trump] abruptly announced, via Twitter—without any of the formality or deliberative processes that generally accompany the development and announcement of major policy changes that will gravely affect the lives of many Americans—that all transgender individuals would be precluded from participating in the military in any capacity. These circumstances provide additional support for Plaintiffs' claim that the decision to exclude transgender individuals was not driven by genuine concerns regarding military efficacy." While the National Archives and Records Administration has recommended archiving all social media postings to comply with the Presidential Records Act, the Trump Administration has deleted multiple public posts. Following Alabama Senator Luther Strange's loss to Justice Roy Moore in the September 2017 primary for the Senate special election, Trump deleted at least two tweets previously posted in support of Strange. In November 2017, following criticism from the office of the British Prime Minister regarding Trump's retweeting of several videos from far-right British nationalist group Britain First (see § Britain First videos), Trump tweeted at Twitter user @theresamay, while presumably intending to target @theresa_may; Trump later deleted the original tweet, and sent a new tweet targeting @theresa_may with the same content. In June 2017, the watchdog group CREW and the National Security Archive filed suit against Trump, contending that deletion of tweets is the destruction of presidential records in violation of the Presidential Records Act of 1981. Trump's personal Twitter account was deactivated for eleven minutes on November 2, 2017. The official @POTUS account remained online during the period that the personal account was taken offline. Twitter announced that the account's shutdown was accidental. Moments later, it followed up with the information that a customer support employee deliberately deactivated the account on his last day of work. On November 29, 2017, a German man of Turkish descent named Bahtiyar Duysak was identified by media outlets as being the Twitter employee who deactivated the account. Donald Trump blamed a "rogue employee" for the temporary loss of his account. In his interviews with TechCrunch and CNN Duysak underlined that he didn't do anything illegal. Duysak was working for Twitter's Trust and Safety division while in the U.S. on a work and study visa. After the incident Duysak moved back home to Germany. He stated that his visa had expired. In June 2017, the satirical news program The Daily Show and its network, Comedy Central, set up a temporary museum space on West 57th Street, next to Trump Tower in Manhattan, that was dedicated to Trump's tweets. In August 2017, former CIA agent Valerie Plame Wilson set up a GoFundMe fundraising page in an attempt to buy a majority interest in Twitter and kick Donald Trump off of the network. In January 2019, Trump served hamburgers from McDonald's to the Clemson Tigers champion football team due to the White House's catering staff going on strike. His misspelling on Twitter of hamburger as hamberder was ridiculed on the internet. It became a meme, and was parodied on Saturday Night Live with Trump (played by Alec Baldwin) competing for "hamberders" on the Deal or no deal gameshow. Some commentators view Trump's tweets as having either the purpose or effect of distracting from issues. Dan Mahaffee of the Center for the Study of the Presidency and Congress opined that Trump's tweets distracted from pressing national issues, writing that to dismiss Trump's tweets "as intemperate outbursts or merely stream-of-consciousness responses to current events would thus greatly underestimate their impact and reach" and opining that Trump's tweets elevated "the trivial at the expense of the consequential." Financial Times columnist Courtney Weaver viewed Trump's Twitter attacks against NFL players kneeling during the national anthem as "weapons of mass distraction" that diverted attention from the humanitarian crisis in Puerto Rico following Hurricane Maria, and wrote that "The more time that is spent discussing the president's latest stand-off with the NFL, the less time is spent discussing the Republicans' latest failed efforts to repeal and replace Obamacare, and other administration shortcomings." Analyst Philip Bump of the Washington Post views Trump's Tweets as attempts to distract in times of unfavorable news related to the investigation by special counsel Robert S. Mueller III. Other commentators do not agree with the notion that Trump's tweets are distractions. Essayist Frank Rich of New York magazine argues that Trump's Tweets (1) are frequently news in themselves; (2) indicate a heightened instability within Trump administration; and (3) are not aimed at news consumers, but rather "are intended to rally his base" of supporters. During his 2016 campaign, Trump posted a number of ads on his Facebook page, attacking Hillary Clinton. The ads included parodies of Pokémon Go and Ms. Pac-Man, portraying Hillary Clinton as a Pokémon and as Ms. Pac-Man. He also used the platform to issue an apology for the Donald Trump Access Hollywood tape. As president, he received criticism for posting a news story about a purported Kuwaiti travel ban similar to Executive Order 13769; Kuwait's foreign minister confirmed that no such ban existed. A series of accusations which happen one week after Facebook affirmed that the company was ready to cooperate with the parliamentary committee which investigates into the links between the electoral campaign Trump and Russia. Facebook revealed on this occasion that accounts bound according to its analysis to the Russian government had bought for approximately 100 000 dollars of Facebook advertisements during the electoral campaign, what would constitute an important intervention in the U.S. elections. In response, Trump claimed that Facebook was against him, criticizing the website in a series of comments on Twitter published on September 27. He said, "Facebook was always anti-Trump. Television channels were always anti-Trump, where from fake news - the New York Times (which apologized) and the Washington Post were anti-Trump. Collusion?" Zuckerberg replied directly to Donald Trump in a statement posted to Facebook: "Trump says Facebook is against him. Liberals say we helped Trump. Both sides are upset about ideas and content they don't like. That's what running a platform for all ideas looks like." A Wired article stated that as Trump's Facebook ads were controversial, he was charged less per ad than Clinton was, as he was boosted by the clickrate of his ads. In response to this, Facebook released data showing that Trump was charged more for his ads, but did not provide data on how the ads were shared by users. Donald Trump initially used his personal account on Instagram (@realDonaldTrump) primarily to share personal pictures, including images of himself with his grandchildren. In September 2015—then with approximately 377 thousand followers— he used the platform to release a political advertisement. This ad, "Act of Love", attacked primary opponent Jeb Bush on the topic of immigration. Along with Bush's responses, it demonstrated that Instagram could be a political tool rather than merely a personal photo-sharing application. Trump also used the platform to contribute to the controversy regarding the 2016 film Ghostbusters by posting a video criticizing the all-female cast. In response, director Paul Feig claimed that "Trump supporters" were responsible for some of the "internet hate" directed at the film. When Trump became president, his personal account had grown to over 5 million followers. He also assumed control of an official account (@whitehouse), where he posted pictures from his inauguration. At that time, it was expected that the official account would primarily feature the work of the Chief Official White House Photographer once one was selected; however, Shealah Craighead has contributed relatively little, especially in comparison to Pete Souza's work during the Obama administration. On July 27, 2016, Trump took part in an Ask Me Anything (AMA), where he responded to user-submitted questions from Reddit's /r/The Donald community. He offered replies on topics that varied from media bias and voter fraud to NASA, including a question about H-1B visas posed by alt-right media personality Milo Yiannopoulos. Trump also posted several pre-debate messages on the subreddit. Trump, Donald J. [@realDonaldTrump] (March 4, 2017). "Terrible! Just found out that Obama had my "wires tapped" in Trump Tower just before the victory. Nothing found. This is McCarthyism!" (Tweet). Retrieved March 21, 2017 – via Twitter. Trump, Donald J. [@realDonaldTrump] (March 4, 2017). "Is it legal for a sitting President to be "wire tapping" a race for president prior to an election? Turned down by court earlier. A NEW LOW!" (Tweet). Retrieved March 21, 2017 – via Twitter. Trump, Donald J. [@realDonaldTrump] (March 4, 2017). "I'd bet a good lawyer could make a great case out of the fact that President Obama was tapping my phones in October, just prior to Election!" (Tweet). Retrieved March 21, 2017 – via Twitter. Trump, Donald J. [@realDonaldTrump] (March 4, 2017). "How low has President Obama gone to tapp my phones during the very sacred election process. This is Nixon/Watergate. Bad (or sick) guy!" (Tweet). Retrieved March 21, 2017 – via Twitter. Trump, Donald J. [@realDonaldTrump] (May 31, 2017). "Despite the constant negative press covfefe" (Tweet). Archived from the original on May 31, 2017. Retrieved May 31, 2017 – via Twitter. Trump, Donald J. [@realDonaldTrump] (May 31, 2017). "Who can figure out the true meaning of "covfefe" ??? Enjoy!" (Tweet). Retrieved June 7, 2017 – via Twitter. ^ Cody Johnston reports that there were 96 installments from 2011 to 2014, including one duplicate. Olivia Nuzzi described the series as only running until 2013, with 83 installments. ^ Donald J. Trump [@realDonaldTrump] (July 2, 2017). "My use of social media is not Presidential - it's MODERN DAY PRESIDENTIAL. Make America Great Again!" (Tweet) – via Twitter. ^ Elizabeth Landers (June 6, 2017). "Spicer: Tweets are Trump's official statements". CNN. Archived from the original on July 20, 2017. ^ Leonhardt, David; Thompson, Stuart A. (June 23, 2017). "Trump's Lies". The New York Times. Archived from the original on June 23, 2017. Retrieved June 24, 2017. ^ Qui, Linda (April 27, 2017). "Fact-Checking President Trump Through His First 100 Days". The New York Times. Archived from the original on June 22, 2017. Retrieved June 25, 2017. ^ Kessler, Glenn; Lee, Michelle Ye Hee (May 1, 2017). "Fact Checker Analysis – President Trump's first 100 days: The fact check tally". The Washington Post. Archived from the original on June 24, 2017. Retrieved June 25, 2017. ^ Drinkard, Jim; Woodward, Calvin (June 24, 2017). "Fact check: Trump's missions unaccomplished despite his claims". Chicago Tribune. Archived from the original on June 25, 2017. Retrieved June 25, 2017. ^ Karni, Annie; Rogers, Katie; Haberman, Maggie (March 18, 2019). "'Be Weak & Die!' Seeking Clues Behind Trump's Weekend Twitter Barrage". The New York Times. ISSN 0362-4331. Retrieved March 19, 2019. ^ Blanton, Dana (June 29, 2017). "Fox News Poll: Voters say Trump's tweets hurting agenda". Fox News. Archived from the original on July 2, 2017. Retrieved July 3, 2017. ^ a b Staff, AOL. "Trump's approval rating sinks as Twitter controversies swirl". AOL.com. Archived from the original on July 3, 2017. Retrieved July 3, 2017. ^ "Poll: Majority of millennials do not like Trump, Twitter". phys.org. Retrieved March 19, 2019. ^ Baumgarten, Matthew (February 3, 2016). "Part One: Social Media's Influence on War & the Political Mind". WDTV. Retrieved February 29, 2016. ^ Lüfkens, Matthias (April 16, 2011). "How World Leaders use Social Media: Why the @WhiteHouse doesn't follow @BarackObama & other idiosyncrasies". Brian Solis. Retrieved June 1, 2012. ^ Bennett, Shea. "President Obama Becomes Third Human, First Politician To Reach 10 Million Twitter Followers". MediaBistro.com. Retrieved June 1, 2012. ^ Jackson, David (September 18, 2011). "Obama's Twitter-verse trails only Gaga, Bieber". USA Today. Retrieved June 1, 2012. ^ "Midterms test whether Republicans not named Trump can win by stoking racial animosity". Washington Post. Retrieved November 5, 2018. ^ Lagorio-Chafkin, Christine (November 19, 2016). "Opinion - Reddit and the God Emperor of the Internet" – via www.nytimes.com. ^ a b c "Trump on Twitter: A history of the man and his medium". BBC News. December 12, 2016. Archived from the original on June 7, 2017. Retrieved June 7, 2017. ^ Feinberg, Ashley (October 6, 2017). "How To Tell When Someone Else Tweets From @realDonaldTrump". Wired. Archived from the original on October 6, 2017. Retrieved October 6, 2017. ^ Matyszczyk, Chris (August 7, 2016). "Trump's tweets: Android for nasty, iPhone for nice?". CNET. Archived from the original on September 29, 2017. Retrieved June 2, 2017. ^ Greenemeier, Larry (August 18, 2016). "Only Some of @realDonaldTrump's Tweets Are Actually Donald Trump". Scientific American. Archived from the original on August 6, 2017. Retrieved June 2, 2017. ^ McGill, Andrew (March 28, 2017). "A Bot That Can Tell When It's Really Donald Trump Who's Tweeting". The Atlantic. Archived from the original on June 8, 2017. Retrieved June 2, 2017. ^ Fandos, Nicholas (April 7, 2017). "Trump's View of Syria: How It Evolved, in 19 Tweets" – via NYTimes.com. ^ "22 Tweets That Came Back to Haunt President Trump". Time. ^ Ingram, Mathew. "Here's Why Facebook Is Partly to Blame for the Rise of Donald Trump". Fortune. Archived from the original on May 24, 2017. Retrieved May 31, 2017. ^ a b Rogers, Katie; Haberman, Maggie (April 16, 2019). "This Just In! Waiting for Mueller, Trump Passes Time Commenting on the News". The New York Times. Retrieved April 17, 2019. ^ Collins, Terry (January 20, 2017). "First Trump administration tweets come from @realDonaldTrump". CNET. Archived from the original on March 25, 2017. Retrieved June 1, 2017. ^ Haberman, Maggie; Thrush, Glenn; Baker, Peter (December 9, 2017). "Inside Trump's Hour-by-Hour Battle for Self-Preservation". The New York Times. ISSN 0362-4331. Retrieved April 15, 2018. ^ "I've Studied the Trump-Fox Feedback Loop for Months. It's Crazier Than You Think". Politico. January 5, 2018. Retrieved January 24, 2018. ^ "Trump Twitter Archive". www.trumptwitterarchive.com. Retrieved January 24, 2018. ^ Lee, Jasmie C.; Quealy, Kevin (January 29, 2016). "Introducing the Upshot's Encyclopedia of Donald Trump's Twitter Insults". The New York Times. Archived from the original on July 3, 2017. Retrieved June 2, 2017. ^ Lee, Jasmie C.; Quealy, Kevin (December 28, 2018). "The 551 People, Places and Things Donald Trump Has Insulted on Twitter: A Complete List". The New York Times. Retrieved January 1, 2019. ^ Johnson, Jenna (December 8, 2016). "This is what happens when Donald Trump attacks a private citizen on Twitter". The Washington Post. Archived from the original on May 31, 2017. Retrieved June 2, 2017. ^ Mann, Ted (December 8, 2016). "Donald Trump Attacks Carrier Union Leader Chuck Jones on Twitter". The Wall Street Journal. Archived from the original on September 6, 2017. Retrieved June 2, 2017. ^ Paquette, Danielle (December 7, 2016). "Donald Trump insulted a union leader on Twitter. Then the phone started to ring". The Washington Post. Archived from the original on May 25, 2017. Retrieved June 2, 2017. ^ Bennett, John T. (August 2, 2018). "Top 10 Trump Nicknames and Why They Stick to His Foes". Roll Call. Retrieved February 19, 2019. ^ Estepa, Jessica. "It's not just 'Rocket Man.' Trump has long history of nicknaming his foes". USA Today. Archived from the original on September 21, 2017. Retrieved September 21, 2017. ^ "The Method Behind Donald Trump's Nickname Madness". Flocku. Archived from the original on September 22, 2017. Retrieved September 21, 2017. ^ Diamond, Jeremy. "Donald Trump's 'Star of David' tweet controversy, explained". CNN. Archived from the original on September 22, 2017. Retrieved September 21, 2017. ^ "Donald Trump's 'Star of David' tweet: a recap". Politifact. Archived from the original on September 13, 2017. Retrieved September 21, 2017. ^ a b Pearce, Matt. "Once again, Trump tweets a meme linked to a brazen racist". Los Angeles Times. Archived from the original on July 4, 2017. Retrieved September 21, 2017. ^ "Trump's Pants on Fire tweet that blacks killed 81% of white homicide victims". Politifact. Archived from the original on September 20, 2017. Retrieved September 21, 2017. ^ Holan, Angie; Qiu, Linda. "2015 Lie of the Year: the campaign misstatements of Donald Trump". Politifact. Archived from the original on March 27, 2016. Retrieved September 22, 2017. ^ a b Smith, Anthony. "Donald Trump's Star of David Hillary Clinton Meme Was Created by White Supremacists". Mic. Retrieved September 21, 2017. ^ a b c Lee, Michelle Ye Hee (July 6, 2016). "Everything you wanted to know about Trump and the six-pointed star". The Washington Post. Archived from the original on October 14, 2017. Retrieved October 7, 2017. ^ Golshan, Tara. "Donald Trump used an alt-right Frozen meme to defend his other Star of David meme". Vox. Archived from the original on September 22, 2017. Retrieved September 21, 2017. ^ Collins, Eliza (July 7, 2016). "Trump on six-pointed star: Can't let it go". USA Today. Archived from the original on October 7, 2017. Retrieved October 7, 2017. ^ Diamond, Jeremy (July 5, 2016). "Donald Trump's 'Star of David' tweet controversy, explained". CNN. Archived from the original on September 26, 2017. Retrieved October 7, 2017. ^ Schwartz, Dana. "An Open Letter to Jared Kushner, From One of Your Jewish Employees". New York Observer. Archived from the original on September 24, 2017. Retrieved September 21, 2017. ^ Nguyen, Tina. "Dana Schwartz isn't buying Jared Kushner's Trump Defence". Vanity Fair. Archived from the original on December 9, 2016. Retrieved September 21, 2017. ^ a b c Parker, Ashley; Wagner, John (November 29, 2017). "Trump retweets inflammatory and unverified anti-Muslim videos". The Washington Post. Retrieved October 27, 2018. ^ Baynes, Chris (December 30, 2017). "Woman who shared Britain First tweets with Donald Trump says it is 'irrelevant' they are misleading". The Independent. Retrieved December 1, 2017. ^ Lawless, Jill (November 29, 2017). "Trump's Muslim retweets draw fire from US and abroad". The Washington Post. Archived from the original on November 30, 2017. Retrieved November 30, 2017. ^ Harrison, Angus (November 29, 2017). "The Truth Behind Those Anti-Muslim Videos Donald Trump Just Retweeted". Vice. Archived from the original on November 30, 2017. Retrieved November 29, 2017. ^ a b "Trump account retweets anti-Muslim videos". BBC News. November 29, 2017. Archived from the original on November 29, 2017. Retrieved November 29, 2017. ^ Baker, Peter; Sullivan, Eileen; Dan, Bilefsky; Haberman, Maggie; Specia, Megan; Goldstein, Laurie; McIntire, Mike; Martin, Jonathan; Kaplan, Thomas; Shear, Michael D. (November 29, 2017). "Trump Shares Inflammatory Anti-Muslim Videos, and Britain's Leader Condemns Them". New York Times. Archived from the original on November 29, 2017 – via Internet Archive. No modern American president has promoted inflammatory content of this sort from an extremist organization. Mr. Trump’s two most recent predecessors, George W. Bush and Barack Obama, both made a point of avoiding public messages that were likely to be seen as anti-Muslim and could exacerbate racial and religious animosities, arguing that the war against terrorism was not a war against Islam. ^ Gillett, Francesca (November 29, 2017). "Donald Trump retweets Britain First deputy: Theresa May condemns US President for sharing anti-Muslim videos". London Evening Standard. Archived from the original on November 29, 2017. Retrieved November 29, 2017. ^ a b c Allen, Nick; Emanuel, Louis (November 29, 2017). "Donald Trump re-tweets anti-Muslim videos from British far-Right group". The Telegraph. Archived from the original on November 29, 2017. Retrieved November 29, 2017. ^ John, Tara (November 29, 2017). "3 Things to Know About Britain First, the Far-Right Group President Trump Retweeted". Time. Archived from the original on November 29, 2017. Retrieved November 29, 2017. ^ Belam, Martin; Holmes, Oliver (November 30, 2017). "'Evil racist': how the UK reacted to Trump's Theresa May Twitter attack". The Guardian. Archived from the original on November 30, 2017. Retrieved November 30, 2017. ^ "Donald Trump retweets Britain First deputy leader's Islamophobic posts". The Independent. November 29, 2017. Archived from the original on November 29, 2017. Retrieved November 29, 2017. ^ Jo Cox widower: Trump 'legitimising' hatred Archived November 30, 2017, at the Wayback Machine, BBC News (November 20, 2017). ^ Brendan Cox, By retweeting Britain First, Trump offends a decency he cannot understand Archived November 30, 2017, at the Wayback Machine, The Guardian (November 29, 2017). ^ a b "The Latest: Sanders defends Trump post of anti-Muslim videos". The Washington Post. November 29, 2017. Archived from the original on November 29, 2017. Retrieved November 29, 2017. ^ Desjardins, Lisa; Bush, Daniel (November 29, 2017). "We asked every senator for their reaction to Trump's anti-Muslim retweets". PBS NewsHour. Retrieved November 30, 2017. ^ a b Masters, James; Landers, Elizabeth (November 29, 2017). "Trump retweets anti-Muslim videos". CNN. Archived from the original on November 29, 2017. Retrieved November 29, 2017. ^ Smith, Saphora (November 30, 2017). "British PM May issues rare rebuke of Trump for retweeting anti-Muslim videos". NBC News. Retrieved November 30, 2017. ^ William Booth & Karla Adam, Trump’s retweets elevate a tiny fringe group of anti-Muslim activists in Britain Archived November 29, 2017, at the Wayback Machine, Washington Post (November 29, 2017). ^ Pilkington, Ed (November 30, 2017). "Far-right hatemongers cheer Trump's Twitter endorsement". The Guardian. Retrieved December 1, 2017. ^ Dearden, Lizzie (November 29, 2017). "Donald Trump retweets Britain First deputy leader's Islamophobic posts". The Independent. Archived from the original on November 29, 2017. Retrieved November 30, 2017. ^ Dan Bilesfsky & Stephen Castle, British Far-Right Group Exults Over Attention From Trump Archived November 30, 2017, at the Wayback Machine, New York Times (November 29, 2017). ^ Allen, Chris (December 1, 2017). "What is Britain First? The far-right group retweeted by Donald Trump". The Conversation. Retrieved December 1, 2017. ^ Epstein, Jennifer; Olorunnipa, Toluse (November 30, 2017). "Sanders Says Trump's Tweets of Anti-Muslim Videos 'Elevate' Debate". Bloomberg News. Retrieved December 1, 2017. ^ David Smith, Donald Trump attacks British PM Theresa May over her criticism of his far-right retweets Archived November 30, 2017, at the Wayback Machine, The Guardian (November 29, 2017). ^ Timberg, Craig; Tsukayama, Hayley (December 18, 2017). "'Twitter purge' suspends account of far-right leader who was retweeted by Trump". Washington Post. ^ Sharman, Jon (January 24, 2018). "Donald Trump apologises for retweeting anti-Muslim videos from Britain First". The Independent. Retrieved February 1, 2018. ^ Lynch, Robbie Gramer, Colum. "In Tacit Rebuke, U.S. Embassy in South Africa Rejects Trump Tweet". Foreign Policy. Retrieved January 14, 2019. ^ CNN, David McKenzie. "South Africa's top diplomat slams Trump tweet as 'right-wing ideology'". CNN. Retrieved January 14, 2019. ^ "Trump tweets incorrect on S.A. land seizures, farmers". @politifact. Retrieved January 14, 2019. ^ Greef, Kimon de; Karasz, Palko (August 23, 2018). "Trump Cites False Claims of Widespread Attacks on White Farmers in South Africa". The New York Times. ISSN 0362-4331. Retrieved January 14, 2019. ^ "Trump under fire for claim of 'large scale killing' of white farmers in South Africa". NBC News. Retrieved January 14, 2019. ^ ""White Genocide" is Not Underway in South Africa". Retrieved January 14, 2019. ^ a b Heigl, Jana (March 21, 2017). "A timeline of Donald Trump's false wiretapping charge". PolitiFact.com. Archived from the original on May 29, 2017. Retrieved May 31, 2017. ^ a b Rucker, Phillip; Nakashima, Ellen; Costa, Robert (March 4, 2017). "Trump, citing no evidence, accuses Obama of 'Nixon/Watergate' plot to wiretap Trump Tower". The Washington Post. Archived from the original on March 7, 2017. Retrieved March 8, 2017. ^ Graves, Allison (March 5, 2017). "Why the White House defense of Trump wiretap accusation is misleading". PolitiFact.com. Archived from the original on May 16, 2017. ^ Perez, Evan; Prokupecz, Shimon; Brown, Pamela (September 18, 2017). "Exclusive: US government wiretapped former Trump campaign chairman". CNN. Archived from the original on September 18, 2017. Retrieved September 19, 2017. ^ "Trump vindicated? Manafort wiretapping report lends credence to claim". Fox News. September 19, 2017. Archived from the original on September 20, 2017. Retrieved September 20, 2017. ^ Graham, David A. (September 19, 2017). "Is Trump's 'Wiretap' Claim Vindicated?". The Atlantic. Archived from the original on September 20, 2017. Retrieved September 20, 2017. ^ Blake, Aaron (September 19, 2017). "CNN says Manafort was wiretapped. Does that vindicate Trump's Obama-spied-on-me claims?". The Washington Post. Archived from the original on September 19, 2017. Retrieved September 25, 2017. ^ Eric Tucker, As Mueller probe intensifies, so do Trump attacks on Comey Archived September 21, 2017, at the Wayback Machine, Associated Press (September 14, 2017). ^ Molly Redden, Russia inquiry: Donald Trump sends barrage of angry tweets as charges reported Archived November 25, 2017, at the Wayback Machine, The Guardian (October 29, 2017). ^ Callum Borchers, Trump’s itchy Twitter finger just triggered speculation about an indictment Archived November 22, 2017, at the Wayback Machine, Washington Post (August 4, 2017). ^ Wehner, Mike (May 31, 2017). "The internet is losing its mind over Donald Trump's 'covfefe' tweet". Boy Genius Report. Archived from the original on May 31, 2017. Retrieved June 1, 2017. ^ Hunt, Elle (May 31, 2017). "What is covfefe? Donald Trump baffles with late night Twitter post". The Guardian. Archived from the original on May 31, 2017. Retrieved May 31, 2017. ^ Griffin, Andrew (May 31, 2017). "Covfefe: What does Donald Trump's tweet actually mean and what was he trying to write?". The Independent. ^ Smith, Allen (May 31, 2017). "Sean Spicer addresses 'covfefe' kerfuffle: Trump 'and a small group of people know exactly what he meant'". Business Insider. Retrieved May 31, 2017. ^ Goldberg, Jonah (May 31, 2017). "L'affaire Covfefe". National Review. Retrieved May 31, 2017. ^ Garber, Megan (May 31, 2017). "Spicer's Razor". The Atlantic. Archived from the original on June 3, 2017. Retrieved June 1, 2017. ^ Borchers, Callum (May 31, 2017). "Is 'covfefe' just another distraction?". The Washington Post (Video). Archived from the original on May 31, 2017. Retrieved May 31, 2017. ^ Joe Uchill (June 12, 2017). "COVFEFE Act would make social media a presidential record". The Hill. Archived from the original on June 12, 2017. Retrieved June 12, 2017. ^ "Laurel, Yanny or ... covfefe? White House joins in on debate". Associated Press. May 17, 2018. Retrieved May 18, 2018. ^ Lamm, Stephanie. "'Covfefe' on list of vanity license plates banned in Georgia". myAJC. Cox Media Group. Archived from the original on June 27, 2017. Retrieved July 2, 2017. ^ "London attack: Mayor Khan calls incident a 'cowardly' act". Fox News. June 3, 2017. Archived from the original on June 4, 2017. Retrieved June 4, 2017. ^ Rothwell, James (June 4, 2017). "Donald Trump lashes out at Sadiq Khan over London terror attacks". The Daily Telegraph. Archived from the original on June 14, 2017. Retrieved June 14, 2017. ^ Trump, Donald J. [@realDonaldTrump] (June 4, 2017). "At least 7 dead and 48 wounded in terror attack and Mayor of London says there is "no reason to be alarmed!"" (Tweet). Retrieved June 14, 2017 – via Twitter. ^ a b c Shirbon, Estelle (June 5, 2017). "Trump renews criticism of London Mayor Khan over attack". Reuters. Archived from the original on June 12, 2017. Retrieved June 5, 2017. ^ a b "'Pathetic excuse': Trump doubles down on London mayor Sadiq Khan". SBS News. June 6, 2017. Archived from the original on June 7, 2017. Retrieved June 14, 2017 – via Reuters. A spokesman for Khan responded that the mayor "has more important things to do than respond to Donald Trump's ill-informed tweet that deliberately takes out of context" his remarks. ^ Rose, Eleanor (June 5, 2017). "Sadiq Khan backed by political rivals in row with Donald Trump". Evening Standard. Archived from the original on June 4, 2017. Retrieved June 6, 2017. ^ "Acting US ambassador to Britain praises London mayor after Trump's criticisms". Fox News. June 5, 2017. Archived from the original on June 5, 2017. Retrieved June 5, 2017. ^ Henderson, Barney (June 5, 2017). "Mayors of America unite in support of Sadiq Khan as Donald Trump renews attack on him". The Daily Telegraph. Archived from the original on June 6, 2017. Retrieved June 6, 2017. ^ Trump, Donald J. [@realDonaldTrump] (June 5, 2017). "Pathetic excuse by London Mayor Sadiq Khan who had to think fast on his "no reason to be alarmed" statement. MSM is working hard to sell it!" (Tweet). Retrieved June 14, 2017 – via Twitter. ^ a b Mackintosh, Eliza (June 5, 2017). "Trump lashes out at London Mayor Sadiq Khan, again". CNN. Archived from the original on June 5, 2017. Retrieved June 5, 2017. ^ Oppenheim, Maya (June 7, 2017). "Donald Trump's sons Eric and Donald Jr back his barbed attacks on Sadiq Khan". The Independent. Archived from the original on June 7, 2017. Retrieved June 14, 2017. ^ Sharman, Jon (June 12, 2017). "John McCain says US global leadership was better under Barack Obama than Donald Trump". The Independent. ^ Beavers, Olivia (June 13, 2017). "McCain walks back comments about American leadership being better under Obama". The Hill. Archived from the original on September 7, 2017. Retrieved June 14, 2017. ^ Siddiqui, Sabrina; Gambino, Lauren (June 11, 2017). "How Trump's actions and tone affect US alliances and perception on global stage". The Guardian. Archived from the original on June 13, 2017. Retrieved June 14, 2017. ^ "Doha's Actions May Destabilize the Region: Saudi Minister". Newsweek ME. 14 June 2017. Archived from the original on 14 June 2017. Retrieved 2 July 2017. ^ a b "Qatar row: Trump claims credit for isolation". BBC. Archived from the original on 7 June 2017. ^ Trump, Donald J. [@realDonaldTrump] (June 6, 2017). "During my recent trip to the Middle East I stated that there can no longer be funding of Radical Ideology. Leaders pointed to Qatar – look!" (Tweet). Retrieved June 7, 2017 – via Twitter. ^ Trump, Donald J. [@realDonaldTrump] (June 6, 2017). "So good to see the Saudi Arabia visit with the King and 50 countries already paying off. They said they would take a hard line on funding..." (Tweet). Retrieved June 7, 2017 – via Twitter. ^ Trump, Donald J. [@realDonaldTrump] (June 6, 2017). "...extremism, and all reference was pointing to Qatar. Perhaps this will be the beginning of the end to the horror of terrorism!" (Tweet). Retrieved June 7, 2017 – via Twitter. ^ "U.S. military praises Qatar, despite Trump tweet". Reuters. 6 June 2017. Archived from the original on 7 June 2017. Retrieved 8 June 2017. ^ "Trump appears to take credit for Gulf nations' move against Qatar". CNN. Archived from the original on 7 June 2017. ^ "Tillerson says break with Qatar by Saudi Arabia, others won't affect counter-terrorism". CNBC. 5 June 2017. Archived from the original on 5 June 2017. Retrieved 5 June 2017. ^ a b c Abramson, Alana (June 29, 2017). "Melania Trump Wants to Fight Cyberbullying. But She's Defending Trump's Mika Brzezinski Tweets". Fortune. Retrieved June 29, 2017. ^ a b Grynbaum, Michael M. (June 29, 2017). "Trump Mocks Mika Brzezinski; Says She Was 'Bleeding Badly From a Facelift'". The New York Times. ^ a b c "The Latest: Left, right unite against Trump tweet". ABC News. June 29, 2017. Archived from the original on June 29, 2017. Retrieved June 29, 2017. ^ Stelter, Brian (June 29, 2017). "Trump tweets shocking assault on Brzezinski, Scarborough". CNN. Archived from the original on June 29, 2017. Retrieved June 29, 2017. ^ Blake, Aaron (June 29, 2017). "Trump's very bad tweets about Mika Brzezinski are a microcosm of his struggling presidency". Washington Post. Archived from the original on June 29, 2017. Retrieved June 29, 2017. ^ Koronowski, Ryan (June 29, 2017). "White House vigorously defends Trump's sexist tweets about Mika Brzezinski". ThinkProgress. Archived from the original on August 12, 2017. Retrieved June 29, 2017. ^ Gambino, Lauren (July 1, 2017). "'Dumb as a rock Mika': Donald Trump back on attack against Morning Joe hosts". The Guardian. Archived from the original on July 1, 2017. Retrieved July 1, 2017. ^ "President Trump Job Approval". RealClearPolitics. Archived from the original on October 4, 2017. Retrieved July 6, 2017. ^ a b c d Nakamura, David (July 2, 2017). "Trump appears to promote violence against CNN with tweet". Washington Post. Archived from the original on July 2, 2017. Retrieved July 2, 2017. ^ Disis, Jill (July 2, 2017). "CNN: Trump's latest tweet 'encourages violence against reporters'". CNNMoney. Archived from the original on July 2, 2017. Retrieved July 2, 2017. ^ Abramson, Alana (July 2, 2017). "Trump Just Tweeted a Video of Him Punching CNN in the Face". Time. Archived from the original on July 2, 2017. Retrieved July 2, 2017. ^ Pengelly, Martin; Walters, Joanna (July 2, 2017). "Trump wrestling body-slam tweet 'encourages violence against reporters', CNN says". The Guardian. Archived from the original on July 2, 2017. Retrieved July 2, 2017. ^ Alva, Mitchell (July 2, 2017). "'No one would perceive that as a threat,' adviser says of Trump's CNN tweet". ABC News. Archived from the original on July 2, 2017. Retrieved July 2, 2017. ^ Borchers, Callum (July 6, 2017). "Trump took a question from a reporter he considered hiring and used it to bash the media". Washington Post. Archived from the original on July 6, 2017. Retrieved July 6, 2017. ^ Gabbatt, Adam (July 5, 2017). "Reddit user who created anti-CNN gif used by Trump says sorry for racist posts". The Guardian. Archived from the original on July 5, 2017. Retrieved July 6, 2017. ^ Shankar, Dakshayani (July 3, 2017). "WH says Trump didn't obtain CNN wrestling video from Reddit". ABC News. Archived from the original on July 4, 2017. Retrieved July 4, 2017. ^ Keith, Tamara (December 20, 2018). "From 'Covfefe' To Slamming CNN: Trump's Year In Tweets". NPR.org. Retrieved December 21, 2018. ^ Donald J. Trump [@realDonaldTrump] (September 19, 2017). "The🇺🇸has great strength & patience, but if it is forced to defend itself or its allies, we will have no choice but to totally destroy #NoKo" (Tweet) – via Twitter. ^ Johnson, Alex (September 25, 2017). "Twitter Promises to Clarify Rules in Wake of Trump North Korea Threat Tweets". NBC News. Archived from the original on September 26, 2017. Retrieved September 25, 2017. ^ Kristine Phillips, All the times Trump personally attacked judges — and why his tirades are 'worse than wrong' Archived November 3, 2017, at the Wayback Machine, Washington Post (April 26, 2017). ^ a b Corky Siemaszko, Experts: Trump Undermines Judiciary With Twitter Attack on Judge Robart Archived July 27, 2017, at the Wayback Machine, NBC News (February 7, 2017). ^ a b Eric Bradner & Jeff Zeleny, Trump: 'If something happens blame' the judge Archived August 30, 2017, at the Wayback Machine, CNN (February 5, 2017). ^ John T. Bennett, Trump Criticizes His Justice Department Over 'Watered Down' Travel Ban: President wants DOJ to ask Supreme Court to review initial executive order Archived June 28, 2017, at the Wayback Machine, Roll Call (June 5, 2017). ^ Trump complains about his own Justice Department over blocked travel ban Archived July 3, 2017, at the Wayback Machine, Associated Press (June 5, 2017). ^ Gabrielle Levy, Trump Criticizes Justice Department Over His Travel Ban Archived July 21, 2017, at the Wayback Machine, U.S. News & World Report (June 5, 2017). ^ "Trump again at war with 'deep state' Justice Department". CNN. Retrieved March 18, 2018. ^ Watson, Kathryn. "Trump lashes out at FBI, State and Justice Departments for "leaking, lying and corruption"". CBS News. Retrieved March 18, 2018. ^ Shelbourne, Mallory. "Trump: FBI's reputation in tatters". The Hill. Retrieved March 18, 2018. ^ Shear, Michael; Savage, Charlie; Haberman, Maggie. "Trump Attacks Rosenstein in Latest Rebuke of Justice Department". The New York Times. Retrieved March 18, 2018. ^ Griffiths, Brent. "Trump slams Comey, mentions Mueller for first time in tweet". Politico. Retrieved March 18, 2018. ^ "Trump intensifies criticism of 'beleaguered' Atty. Gen. Jeff Sessions". Los Angeles Times. Retrieved March 18, 2018. ^ "Trump accuses Jeff Sessions of taking a 'very weak' position on 'Hillary Clinton crimes'". Los Angeles Times. Retrieved March 18, 2018. ^ Keneally, Meghan. "Timeline leading up to Jeff Sessions' recusal and the fallout". ABC News. Retrieved March 18, 2018. ^ Walters, Joanna. "Trump attacks Jeff Sessions over inquiry into alleged surveillance abuses". The Guardian. Retrieved March 18, 2018. ^ Breuninger, Kevin. "Trump attacks Attorney General Jeff Sessions again, this time over Obama and Russian meddling". CNBC. Retrieved March 18, 2018. ^ Watkins, Eli. "Trump: Tillerson 'wasting his time' negotiating with North Korea". CNN. Retrieved March 18, 2018. ^ Singletary, Michelle. "Trump dumped Secretary of State Rex Tillerson in a tweet. What's the worst way you've been fired?". The Washington Post. Retrieved March 18, 2018. ^ Calia, Mike. "Trump criticizes national security advisor HR McMaster's comments about Russian meddling in the 2016 election". CNBC. Retrieved March 18, 2018. ^ Rosenblatt, Kahlan (January 21, 2019). "Man already in custody believed to be connected to string of Nevada murders". NBC News. Retrieved January 22, 2019. ^ Morton, Victor (January 21, 2019). "Trump seizes upon Wilbur Martinez-Guzman case, demands 'powerful' border wall". Washington Times. Retrieved January 22, 2019. ^ Monduy, Sydney (January 10, 2019). "Brother of Cop Killed by Illegal Immigrant: 'It Felt Good' to Hear Trump Speak up for My Family in Address". Independent Journal Review. Retrieved January 11, 2019. ^ Guerra, Patty (January 10, 2019). "Brother of Newman Corporal Ronil Singh appears with President Trump in visit to border". Modesto Bee. Retrieved January 11, 2019. ^ Cannon, Austin (August 21, 2018). "Trump says Mollie Tibbetts' death 'should've never happened,' calls immigration laws 'a disgrace'". Des Moines Register. Retrieved January 22, 2019. ^ Shanahan, Mark (June 13, 2017). "Stephen King has been blocked by Trump on Twitter". Boston Globe. Archived from the original on June 13, 2017. Retrieved June 14, 2017. ^ Shelbourne, Mallory (June 13, 2017). "Trump blocks veterans group on Twitter". The Hill. Archived from the original on June 13, 2017. Retrieved June 14, 2017. ^ Savage, Charlie (July 11, 2017). "Twitter Users Blocked by Trump File Lawsuit" – via NYTimes.com. ^ Wong, Julia Carrie (July 11, 2017). "Twitter users sue Donald Trump for blocking them over critical comments". The Guardian. Archived from the original on July 11, 2017. Retrieved July 11, 2017. ^ Savage, Charlie (July 11, 2017). "Twitter Users Blocked by Trump File Lawsuit". The New York Times. Archived from the original on July 11, 2017. Retrieved July 11, 2017. ^ Epps, Garrett. "Why a Judge Ruled That Trump ...." The Atlantic. May 24, 2018. May 24, 2018. ^ Baker, Peter; Thrushmay, Glenn (May 31, 2017). "Less Tweeting, Lawyers Beg. 'Covfefe,' the President Says". The New York Times. Archived from the original on July 21, 2017. Retrieved June 1, 2017. ^ Joseph P. Williams, Courts Considered Trump's Twitter in Ruling Archived September 11, 2017, at the Wayback Machine, U.S. News & World Report (June 12, 2017). ^ Erik Larson, Trump Risks Undermining Travel-Ban Defense With Anti-Muslim Videos Archived November 30, 2017, at the Wayback Machine, Bloomberg (November 29, 2017). ^ a b Ephrat Livni, A judge called out Trump’s tweets in an order blocking his transgender soldier ban Archived November 13, 2017, at the Wayback Machine, QZ (October 31). ^ a b Doe v. Trump Archived October 30, 2017, at the Wayback Machine (D.D.C. October 30, 2017). ^ Garrett Epps, Trump's Tweets Take Down His Military Ban on Trans People Archived November 26, 2017, at the Wayback Machine, The Atlantic (November 1, 2017). ^ Trump, Donald J. "Based on the tremendous cost and cost overruns of the Lockheed Martin F-35, I have asked Boeing to price-out a comparable F-18 Super Hornet!". ^ Trump, Donald J. (August 16, 2017). "Amazon is doing great damage to tax paying retailers. Towns, cities and states throughout the U.S. are being hurt - many jobs being lost!". ^ "Donald Trump just wiped $5.7bn off the value of Amazon with a single tweet". August 16, 2017. ^ Trump, Donald J. (August 13, 2016). "The failing @nytimes has become a newspaper of fiction. Their stories about me always quote non-existent unnamed sources. Very dishonest!". ^ Estepa, Jessia (September 27, 2017). "President Trump deletes his recent tweets about Sen. Luther Strange. Can he do that?". USA Today. Archived from the original on September 27, 2017. Retrieved September 27, 2017. ^ Jackson, Henry C. (September 26, 2017). "After Luther Strange loses in Alabama, Trump's supportive tweets disappear". Politico. Archived from the original on September 27, 2017. Retrieved September 27, 2017. But Trump then appears to have deleted at least two tweets, sent earlier in the day, that offered strong endorsements of Strange, whom Trump campaigned for Friday in a boisterous rally in Huntsville, Alabama. ^ "Trump criticized in Britain and U.S. for sharing anti-Muslim videos". Reuters. November 30, 2017. Retrieved November 30, 2017. ^ Brady, Gerard (November 29, 2017). "The best part about this is that a random woman called Theresa May Scrivener, with 6 followers. just received a diplomatic correspondence by tweet from the US President #Trump #TrumpTweets #specialrelationshippic.twitter.com/tSpD1Io14t". @GerardBrady100. Retrieved November 30, 2017. ^ Trump, Donald J. (November 29, 2017). ". @Theresa_May, don't focus on me, focus on the destructive Radical Islamic Terrorism that is taking place within the United Kingdom. We are doing just fine!". @realDonaldTrump. Retrieved November 30, 2017. ^ Hassan, Jennifer (November 30, 2017). "Donald Trump blasted Theresa May on Twitter. Unfortunately, he got the wrong woman". Washington Post. ISSN 0190-8286. Retrieved November 30, 2017. ^ Goldman, Russell (September 27, 2017). "Trump Deletes Tweets Supporting Luther Strange". The New York Times. Archived from the original on September 27, 2017. Retrieved September 27, 2017. At least two government watchdog groups, Citizens for Responsibility and Ethics in Washington and the National Security Archive, believe that when Mr. Trump deletes a tweet he may be breaking the law. ^ Rachel Siegel; Hayley Tsukayama; J. Freedom du Lac (November 3, 2017). "Rogue Twitter employee on last day of job deactivated Trump's personal account, company says". The Washington Post. Nash Holdings LLC. Archived from the original on November 4, 2017. ^ David Caplan (November 2, 2017). "Trump's Twitter account briefly deactivated by Twitter employee on last day, company says". ABC News. The Walt Disney Company. Archived from the original on November 3, 2017. Retrieved November 3, 2017. ^ Selina Wang (November 2, 2017). "Twitter Employee Deactivated Trump's Account on Last Day at Work". Bloomberg News. Bloomberg L.P. Archived from the original on November 4, 2017. Retrieved November 3, 2017. ^ Wong, Julia Carrie (November 30, 2017). "Ex-Twitter worker who 'admires' Trump says he was behind account deactivation" – via www.theguardian.com. ^ "Ex-Twitter Worker Claims Responsibility for Trump's Account Shutdown". The New York Times. Reuters. November 29, 2017. Archived from the original on December 4, 2017. Retrieved December 29, 2018. ^ Lunden, Ingrid. "Meet the man who deactivated Trump's Twitter account". techcrunch.com. Retrieved December 4, 2017. ^ Seetharaman, Deepa; Koh, Yoree; Wells, Georgia (December 1, 2017). "Silicon Valley Struggles to Add Conservatives to Its Ranks". Retrieved December 4, 2017 – via www.wsj.com. ^ "Trump Twitter "Saboteur," Bahtiyar Duysak, Goes from Hero to Zero". HuffPost. November 30, 2017. Retrieved December 4, 2017. ^ Terdiman, Daniel (November 29, 2017). "Bahtiyar Duysak, who deleted Trump's Twitter: I didn't break any rules". Fast Company. Retrieved December 4, 2017. ^ "Ex-contractor says he shut Trump's Twitter account by accident". December 11, 2017 – via www.reuters.com. ^ Segall, Laurie. "The guy who took down Trump's Twitter account says it was 'a mistake'". cnn.com. Retrieved December 4, 2017. ^ "Bahtiyar Duysak, l'uomo che ha spento l'account Twitter di Trump: "Solo un errore"" [Bahtiyar Duysak, the man who turned off Trump's Twitter account:" Just a mistake "]. Repubblica.it (in Italian). November 30, 2017. Retrieved December 4, 2017. ^ "The bird, the apple and the ghost: This week in tech". The bird, the apple and the ghost: This week in tech. Retrieved December 4, 2017. ^ Reuters (November 29, 2017). "Ex-Twitter Worker Claims Responsibility for Trump's Account Shutdown". Archived from the original on December 4, 2017. Retrieved December 4, 2017 – via www.nytimes.com. ^ "Ex-Twitter-Mitarbeiter räumt Abschaltung von Trumps Twitter-Konto ein". finanzen.net. Retrieved December 4, 2017. ^ Evans, Greg (June 17, 2017). "'Daily Show' Trump Twitter Library Extends Hours "Due To Popular Demand"". Deadline. Archived from the original on June 18, 2017. ^ "'The Daily Show' is unveiling the Trump Twitter Library". Washington Post. Associated Press. June 13, 2017. ^ "Former CIA agent wants to buy Twitter to kick Trump off". San Francisco Chronicle. Associated Press. August 23, 2017. Archived from the original on August 23, 2017. Retrieved August 23, 2017. ^ Richard Wolffe, Out of control? Or is Trump's tweeting designed to distract? Archived September 21, 2017, at the Wayback Machine, The Guardian (March 4, 2017). ^ Dan Mahaffee, Trump's tweets distract us from America's pressing challenges Archived November 22, 2017, at the Wayback Machine, The Hill (September 27, 2017). ^ Courtney Weaver, Donald Trump’s tweets are weapons of mass distraction Archived October 1, 2017, at the Wayback Machine, Financial Times (September 26, 2017). ^ Philip Bump, Trump's latest Mueller distraction: An incorrect tweet on a misleading story Archived November 22, 2017, at the Wayback Machine, Washington Post (October 30, 2017). ^ Frank Rich, Trump's Tweets Are Not a Distraction: They Demonstrate a New Level of Instability Archived November 30, 2017, at the Wayback Machine, New York (July 3, 2017). ^ Stracqualursi, Veronica. "Trump and Clinton Talk Pokemon Go". ABC News. Archived from the original on November 7, 2017. Retrieved June 2, 2017. ^ Myhr, Peder (August 4, 2016). "Trump attack ad casts Hillary Clinton as 'Ms. Pac-Man'". Global News. Archived from the original on May 27, 2017. Retrieved June 2, 2017. ^ Haake, Garrett (October 8, 2016). "Trump issues Facebook apology for lewd comments". WUSA. Archived from the original on November 7, 2017. Retrieved June 7, 2016. ^ Gray, Lorna (June 2, 2017). "'Fake news' obsessed Donald Trump posted some, um, fake news to Facebook". MSN. Archived from the original on February 10, 2017. Retrieved June 7, 2017. ^ Browning, Noah (February 5, 2017). "Kuwait denies it imposed travel ban praised by Trump". Reuters. Archived from the original on July 12, 2017. Retrieved June 7, 2017. ^ Shane, Scott; Goel, Vindu (September 6, 2017). "Fake Russian Facebook Accounts Bought $100,000 in Political Ads". The New York Times. ISSN 0362-4331. Retrieved February 28, 2018. ^ "Mark Zuckerberg". www.facebook.com. Retrieved February 28, 2018. ^ Tsukayama, Hayley (September 27, 2017). "Mark Zuckerberg responds to Trump's accusation that Facebook has always been 'anti-Trump'". Washington Post. ISSN 0190-8286. Retrieved February 28, 2018. ^ "How Trump Conquered Facebook Without Russian Ads". Wired.com. Retrieved February 28, 2018. ^ "This Spicy Drama About Facebook CPMs Has People Like "Wahh?" And "Whoaaa"". BuzzFeed. Retrieved February 28, 2018. ^ a b c Garofoli, Joe (September 6, 2015). "Trump and Bush attack ads turn Instagram into a battleground". San Francisco Chronicle. Archived from the original on March 3, 2016. Retrieved June 6, 2017. ^ a b c d Heil, Emily (January 21, 2017). "Donald Trump looks sad in his first Instagram post from the White House account". The Washington Post. Archived from the original on October 17, 2017. Retrieved June 6, 2017. ^ Mulé, Sarah (November 2, 2016). "Director Paul Feig on his 'Ghostbusters' cast: 'These are strong, smart women'". United Press International. Archived from the original on June 6, 2017. Retrieved June 1, 2017. ^ O'Kane, Sean (April 2, 2017). "The photography of Trump's presidency is a huge break from Obama's". The Verge. Archived from the original on April 2, 2017. Retrieved June 6, 2016. ^ Luckhurst, Phoebe (November 25, 2016). "Who is Milo Yiannopoulos? Everything you need to know about Donald Trump's alt-Right poster boy". standard.co.uk. the Evening Standard. Archived from the original on February 6, 2017. ^ Bixby, Scott (July 27, 2016). "From the media to moon landings: Trump takes questions in Reddit AMA". The Guardian. Archived from the original on May 11, 2017. Retrieved June 2, 2017. ^ Dicker, Rachel (July 27, 2016). "People Got to Ask Donald Trump Anything – Sort of". U.S. News & World Report. Archived from the original on November 7, 2017. Retrieved June 2, 2017. ^ Powell, Austin (October 10, 2016). "Trump Posts to Reddit, Prompting Massive Rigging of Online Debate Polls". The Daily Dot. Archived from the original on October 8, 2017. Retrieved October 8, 2017. ^ Sankin, Aaron (October 19, 2016). "Reddit Explodes After Trump Posts Pregame Debate Message". The Daily Dot. Archived from the original on October 8, 2017. Retrieved October 8, 2017. ^ a b c Johnston, Cody (November 7, 2016). "Why Does Nobody Know About Trump's Vlog" (Video). Cracked.com. Archived from the original on April 20, 2017. Retrieved June 1, 2017. ^ a b c Nuzzi, Olivia (February 29, 2016). "Inside Trump's Make Believe Presidential Addresses". The Daily Beast. Archived from the original on November 30, 2017. Retrieved June 1, 2017. ^ "From The Desk of Donald Trump". YouTube. Archived from the original on April 20, 2016. Retrieved June 1, 2016. Wikimedia Commons has media related to Donald Trump and Twitter. This page was last edited on 25 April 2019, at 11:42 (UTC).